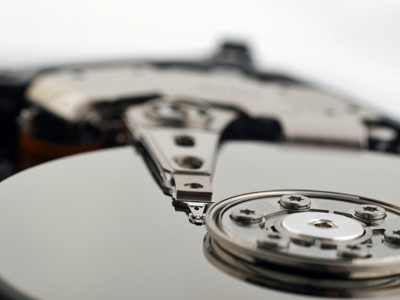 We have already understood hard drive platters logical storage and hard drive spindle and platters. Now we can take a closer look on the magnetic head itself and it`s basic principles of work. 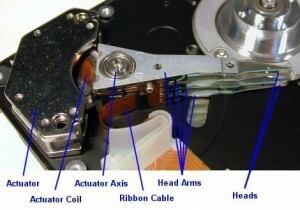 What is the main mechanical principle of the hard drive magnetic head? The magnetic head is levitating over the platters and is never touching them. As of the current tech level, the head are hoovering only a few nanometers from the platters, following the rule that as closer as it gets, the higher precision reads/writes it will be able to make. A head, touching the surface of a platter will most likely damage the head itself and/or damage the platters irreversably. This is one of the reasons why vibrating, hitting or shocking a hard drive in any way is generally not a good idea, unless you are trying to kill the hard drive. In my practise the usual way to damage a hard drive(and get your warranty, so it could be replaced), was to get the drive running(e.g. platters rotating) and then hit it with a rubber hammer – hard enough to vibrate it, but soft enough not to leave any trace(if you feel unsure or doing it for the first time – you could wrap the drive in towels if needed, so no physical evidenece would be present form the hit). So basicly what this does is to make the heads vibrate so violently, that they touch the platters. On the other side, the platters rotate so fast, that they are almost ripping of parts of the heads, which touch them. Something like putting your hand in a rotating attic fan – the same effect will happen on heads touching the rotating platters. The beautiful thing hee is that noone could tell what exactly is wrong, unless they have special equipment and expirience in such problems. The common result(like 100% in my cases) is to get the drive replaced under warranty immediately, supposing a manufacturing defect. Although, shocking a drive is not a warranty case, so if they find a way to prove it(read data from a sensor, which tells them it exceeded shocking treshold), they`ll be in their right to refuse the warranty service. But this is yet the best way I was getting rid of old, failing drives with bad sectors on them(and getting new one or a refund). How is this situation prevented? As hard dirves developed, it has become clear, that somehow the contact between the heads and platters must be prevented. The first idea of it was called “head parking”. This basicly means that the heads are removed from the platters, to a safe position where they could not harm the platters or themselves. The early versions of this technology required the computer to send a singal, which will force the hard drive to park it`s heads to this so called “parking zone”. Advancing further, hard drives were automatically parking their heads on power loss or when entering a sleeping/power saving mode. This is why an unpowered hard drive could survive a lot more shocking than a running hard drive. It`s common to see on hard drive specification, that it could survive a 3g, 4g or 5g shock while running and over 100g shocks if unpowered. Yet it is not a good idea to depend on this(e.g. rolling your hard drive on the ground and kicking it, hoping that because it is unpowered it will survive this test). Even further, some hard drives(mostly portable ot laptop drives) include the so called “Free Fall Sensor”(FFS). This is basicly an accelerometer, just as the one you may have in your smart phone. It`s used to detect if the drive is falling or recieving too much shock. When the FFS kicks in, it is taking protective measures, such as parking the heads away from the platters and shutting down the spindle, trying to prevent any possible damage to it. Seems too complicated for a simple writing magnetic head, huh. Why? Well, in the beginning all hard drives were using magnetic heads as simple, as the ones in your VCR for example or any other tape recorder. At this time the hard drives were measured in hundreds of megabytes – let`s say a 600MB drive would have this simple type of head, or a 1.2GB hard drive. Later, things got a bit complicated. To reach bigger capacities, a new type of head had to be used in order to reach higher density per platter(or as accepted – GB per square inch). A smaller head, which should be able to read and write more precisly. This type was called Metal In Gap(MIG) heads. They allowed reaching the sizes of 4GB and 8GB hard drives. Although they could do more, they were not pushed forward due to reaching certain stability limits and a new standart arose. Magnetoresistance and giant magnetoresistance was the succeding technology, which basicly is splittign the hard drive head into two pieces – one head for reading and one head for writing. This allowed to change the method of reading and writing, adding up to the fact that hte head got a lot more smaller when separated. Applying this technique allowed rapidly to increase aerial platter density adn reach hard drives with capacities of up to 40GB. Although it was good, it was not good enough, so we jumped over the next technology. Tunneling magnetoresistive (TMR) approach on the magnetic heads is simply a way to “channel” the magnetic impulse to the platter and make it more precise. A more precise placement of the data allows the data to be layed closer to each other, resulting in simply growing the capacity further. This technology is present in some of the drives we are currently using. 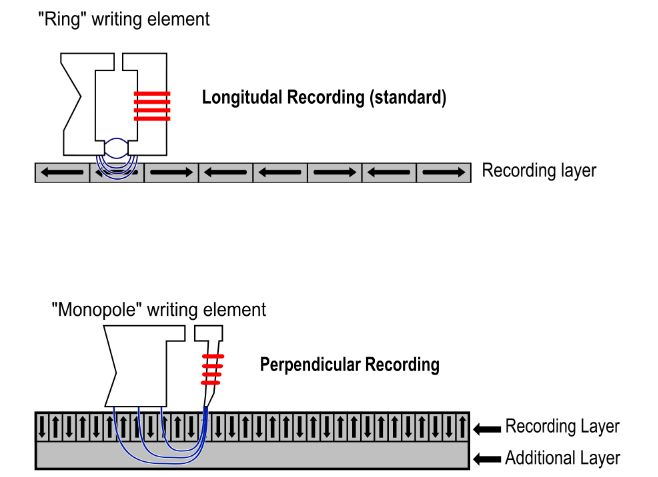 The most common technology we use today is called Perpendicular magnetic recording (PMR) is the other one you may see in a hard drive these days. Compared to TMR it is using the vertical space on the platter to store data, instead of using the horizontal space. As you can see on the picture, this allows to increase signifcantly the density, lowering the gaps between cylinders and sectors to such tiny levels, that no other technoly is yet possible to deliver. And this is why the thing got too complicated and driven far away from the usual magnetic head it was in the beggining. Postioning of the heads over the platters – how is it done? The approarch to position a head over a platter is done by the accutator. It is basicly using a magnetic field to move a coil inside the field. This can be compared to a high precision stepper motor, but a lot faster and a lot accurate(having anywhere from a few thousand positions per inch to a few hundread thousands positions per inch). Each postion of the accutator means a new cylinder position for the head. And this is why it so important to have as many positions as possible on the accutator. There are also some issues, related to temperature changes. As the entire hard drive is made of metal materials, it is expanding and contracting with the temperature. As you might imagine, even a small exapnding, means that the accutator is shifting its positioning with a little bit. Or simply said it will hit Cyl 78 at temperature of 20C, and let`s say for our example that at temperature of 38C it will hit Cyl 79, if it tries to position the head with the same position of the coil. By temperature shifting a change occurs. And the change is so great, that it will result in a total mess. Tto get around this problem, the accutator is being re-adjusted every minute or so(some hard drives even depend on sensors to understand when they need to do it). With the simple adjustment of the accutator, the hard drive is aware how to compensate the thermal effects which may cause problems. Generally it is not a good idea to deal thermal shocks to your drive while it is running. There are a lot of other things about the heads themselves and the way they operate, but this is the basic scenario adn the main information you may need about it.